Old Raj Gin Blue Label -110 proof – Old Raj is distinctive in that it contains a measure of saffron, the rare and costly spice derived from the crocus flower. In addition to the slightly spicy flavor, this also imparts a pale yellow color. The subtle, aristocratic botanical mix (starring, of course, juniper berries) lures you into a warm, delighted sense of well being, a feeling deepened by the sheer silkiness of the spirit. 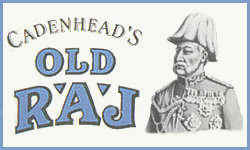 Old Raj Gin Red Label – 92 Proof - Old Raj Dry Gin is made by WM Cadenhead, bottlers of excellent whisky and, so it seems, makers of brilliant dry gin. This spicy, floral gin includes the valuable and rare ingredient saffron.